Great, right? We were encouraged this time around to mix and match the garments so that y’all could see how versatile and practical the patterns are. Well I’m not sure how good a job that I did on that, but I really can see how many of these patterns would work well together. I chose to make the Hudson pants and Julia cardigan- both of which have been on my to-make list for a while. I measured in between the 6 and the 8 and ended up going with the 6 because I knew this is a generous fit pant. They actually ended up being just a little big, but I think that may have been due to my overly-stretchy rib fabric. I’m going to try them again in my french terry and see if that fit is better. The legs weren’t too big- just a relaxed fit look, but I had some funny wrinkles in the front crotch area. Also, I must have ridiculously small ankles because I ended up having to cut 4 inches off the cuff width to make them fit! I ended up taking the legs in a bit too so that the leg opening would fit into the cuff. I started out 1/4″ smaller at the top of the leg and gradually angled down to about 1.5″ at the bottom. That made the pants end up just a bit snug in the legs but I think they’re actually super comfy that way so i’m happy. This is my first pair of pants that I’ve made and I’m so happy with them. Can’t believe I actually made pants! Even if they are sweatpants, I still think it’s pretty cool. 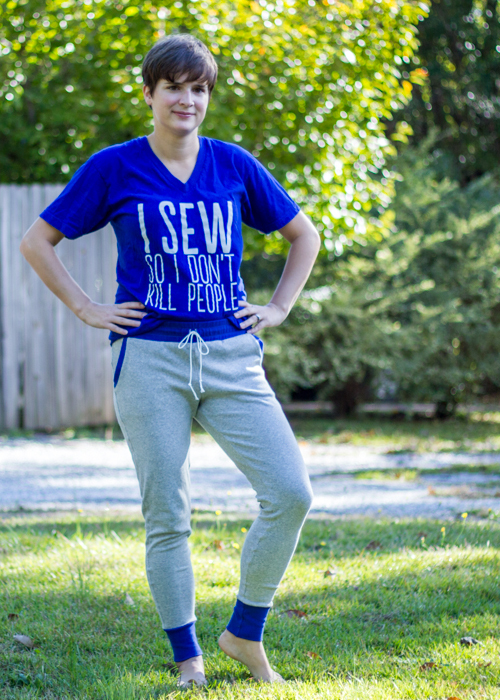 Kelli does a great job with this pattern in walking you through the construction so in my opinion, they come together pretty quickly and easily, especially if you use your serger for most of the construction which I did. 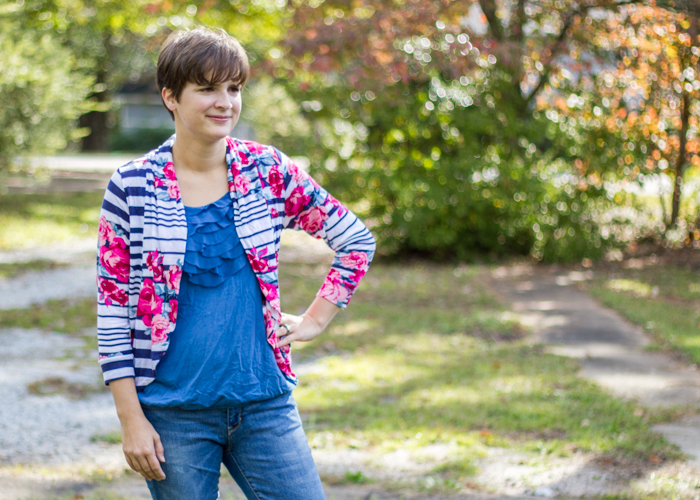 I also made the Julia cardigan. I made a medium and used some tissue weight knit that I bought from Wanderlust Fabric. I chose the 3/4 length sleeves with the doubled over collar version. 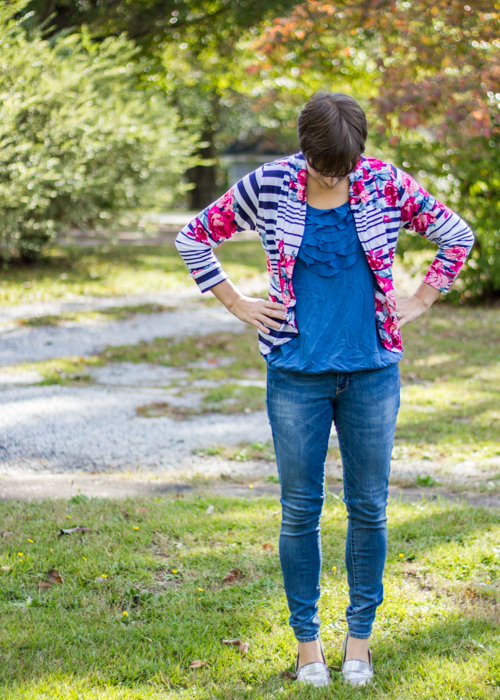 The hardest thing about this cardigan was cutting out the fabric. Because I used a thin knit, it was very shifty and I took a long time to make sure it was cut out straight and on grain. The knit itself is a good quality knit even though it’s thin so I am pleased with the end result. The pattern is very straightforward and comes together pretty quickly. The only thing I would prefer is a few more notches on various pieces (especially the collar) to help match everything up easier. I didn’t end up with any problems so it’s not a huge deal, just a personal preference. I did make a few modifications. First, I shortened the collar piece along the bottom front and back area. I cut half the length off the back piece (about 3″) and angled the front pieces down gradually to meet that piece. I like my 3/4th length cardigans on the shorter side so that’s why I made the alteration. I also tapered the sleeve in a bit and took a few inches off the cuff as Hayley recommends in the pattern instructions if you want a snugger fit in the sleeve. 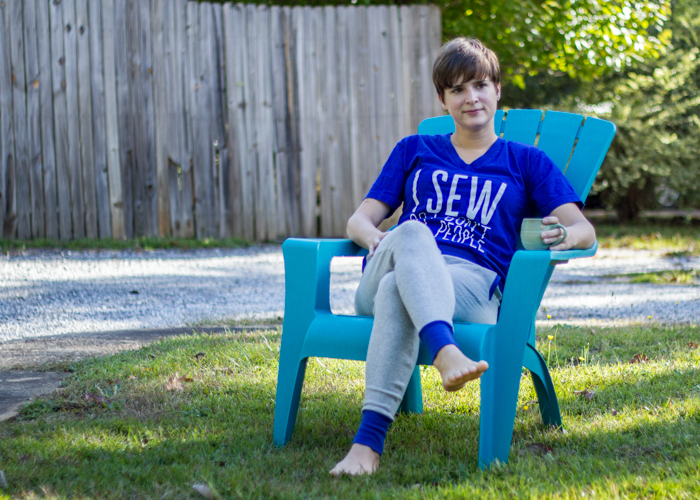 It’s so fun to increase your sewing knowledge to where you feel comfortable making changes to patterns to fit you perfectly! 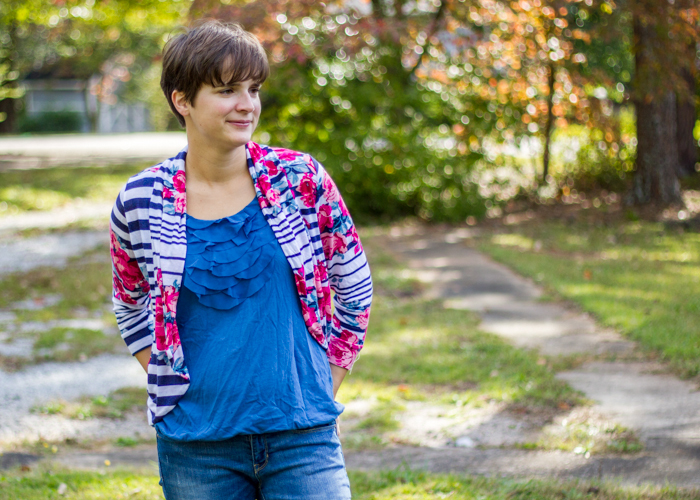 I am looking forward to making another one of these cardigans in a heavier weight knit and long sleeves. One more item of clothing that I can now make instead of buy. Cha-ching! I really like this collection of patterns because they are a great collection to be able to mix and match for your wardrobe. I can’t wait to have time to make up a few more of these patterns. Here’s my version of the two pieces matched together. They don’t mesh super well because I couldn’t find a good t-shirt to wear underneath the cardigan. With the right shirt, I could totally see pulling these two pieces off together! 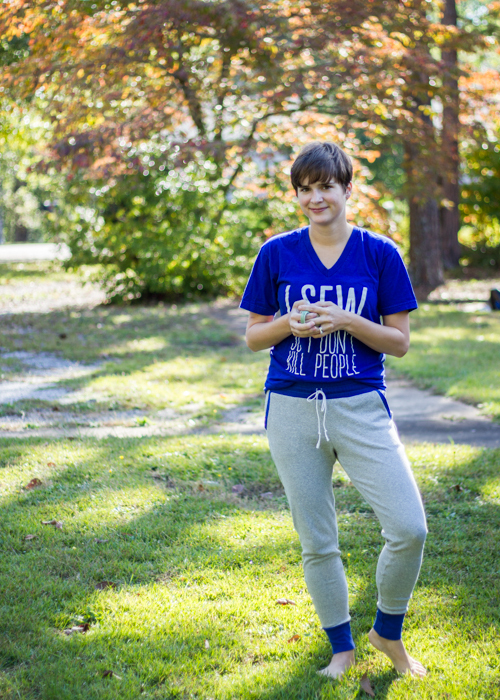 Maybe as an excuse to wear the sweatpants to the grocery store or something?! This parcel, like usual, is only available as a group for two weeks so go get it while you can! 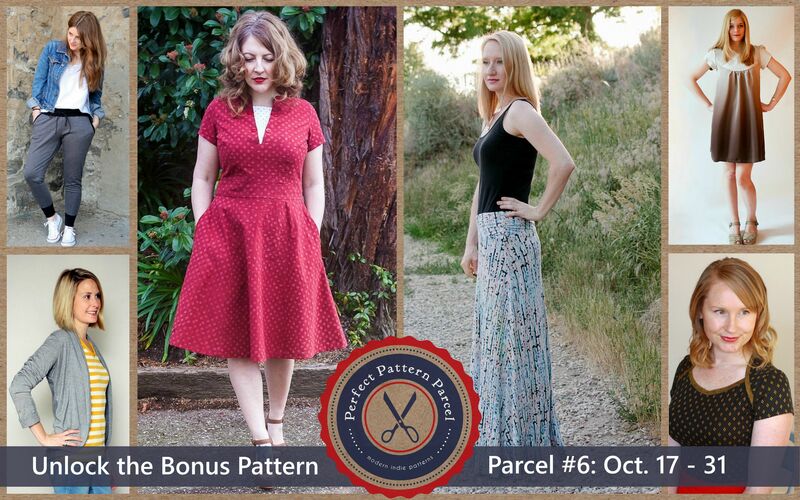 Make sure you check out the IG hashtag #patternparcel for more ideas from these patterns. Full disclosure: I was provided with these patterns in return for blogging about them but all opinions are, as always, my own. This entry was posted in Selfish Sewing and tagged hudson pants, julia cardigan, mouse house creations, patchwork threads, pattern parcel, true bias, women's clothing patterns by oliver's fancy. Bookmark the permalink. I love what you’ve made! Those pants look smashing on you too! That floral/stripe knit is fantastic! I’d totally wear that sweater and pants together. Great makes! 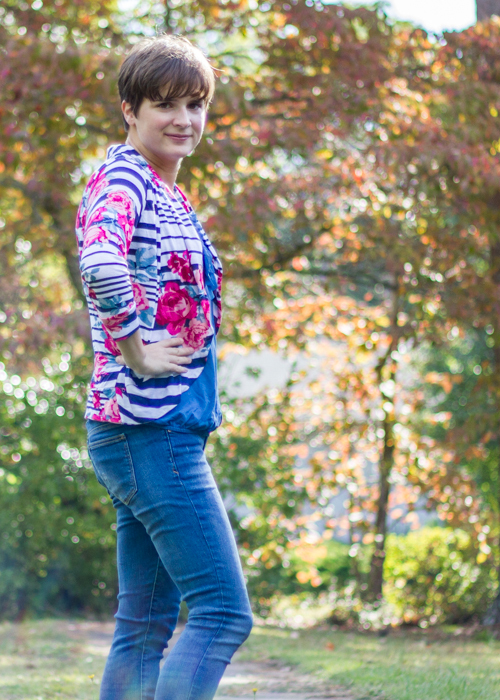 I am in love with your Julia cardi! I sooo hear you about quality knits! I live in a small town and my options of knit fabrics are so limited it is not funny! Thanks! So sad to live in a fabric desert isn’t it? 😦 and I love just about everything about my town except for that. Get some good fabric stores and I’d be in heaven! Oh both look so good! Yeah the “where to find good knits” problem is hard – and really, even when you do have good knit selection like I do, it’s hard to know how different fabrics will actually sew/wear. I’m still working on that myself. Oh man I love my hudson pants; and making adult pants does feel so exciting doesn’t it?? Gotta make another Julia cardi because clearly my issues were mine alone, everyone else says how easy it is…haha. I feel like each new knit I use is a lesson on what types to use for which patterns- sometimes resulting in unusable projects but that’s all part of the learning curve, right? I thought of you when making my cardi and was afraid I’d have similar issues but it fit together just fine so maybe your knit had issues and stretched out? And pants- want to sew lots of pants now. I’m pretty much obsessed with trying to sew an entire wardrobe for myself! I bought this parcel probably just for those pants 😉 I totally love your julia, that fabric is beautiful!